As a happy bird owner, you know that a bird cage is an absolute necessity for your flying friend. If you're like most bird owners, you want a cage that looks great but doesn't cost a fortune. 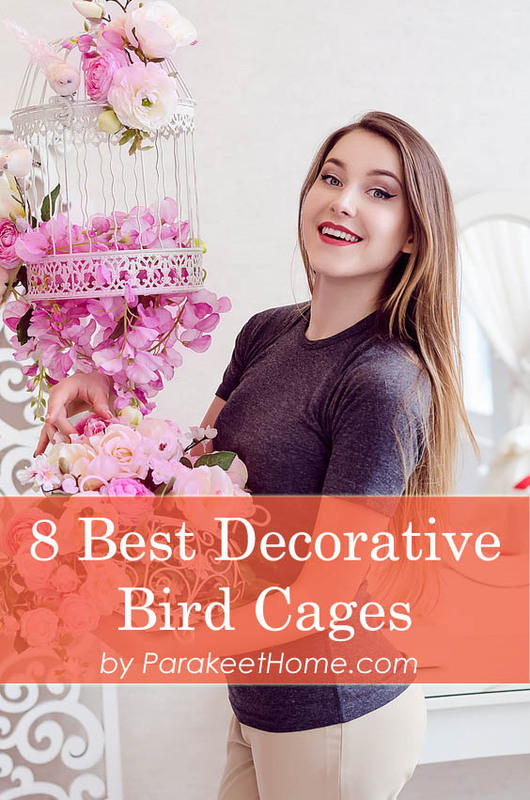 Read on to learn more about the best cheap decorative bird cages you can buy. What Exactly is a Decorative Bird Cage? A bird cage is a home made for pet birds, typically created from wire or cane. Bird cages are typically designed to house birds as pets. There are many different types of bird cages out there, though, so it can be hard to choose the right one. When you're looking for cheap bird cages for your pet friend, it's important to first know where to look. Many home stores and pet stores carry a wide variety of bird cages. Next, keep an eye out for sales. Many retailers -- both brick and mortar stores and online retailers -- frequently have great bird cages marked down in price. You can even set up an alert to be notified when your favorite bird cage goes on sale. In addition, many bird owners opt for cheap decorative cages because the decorations help keep birds awake, alert and interested in their surroundings. You don't have to spend an arm and a leg to get a great quality bird cage. Look for one that's simple, fits your bird's needs and doesn't cost too much! And next, the colorful decorations on a cheap decorative bird cage will help keep your bird fully engaged with his new little world. How to Choose Best Decorative Bird Cages That fit all your Needs! We find that many bird lovers like the round cages and say their small bird (s) is happy and content, finding none of the problems some bird owners express. We aim to please all with an example of all consumer tastes and styles of bird cages. For consumers who own parakeets, these round bird cages make a perfect five star home for your feathered friends. 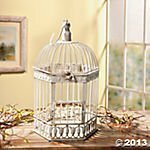 If you are not a bird owner but are looking for a unique way to display plants, flowers, candles, or to use them as unique and fantastic party accessories, the following lovely bird cages may fit your need. We did the research on eight top bird cages for birds. The design of a few of these cages serves as an ornamental focal point decorating the home or office, with multiple purposes, inside or outside the home. Below list offer you the best and cheap cages to spruce up any event. This round ﻿stainless steel ﻿bird cage measures 17 1/2 inch in circumference, 39 1/2 inches to the top of the finial, including the 1/2 inch spacing of the wire. The stainless steel makes this cage very easy to clean. The base unsnaps easily without removing the grille if you so choose. Included is this purchase are carved perches with a unique style and design, two porcelain feeding dishes. 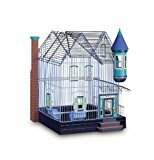 These bird cages make an ideal home for your small birds. This bird cage offers many positive attributes and serves a small bird spices a comfortable and cozy environment with room to exercise and play. This stainless steel bird cage is super simple to assemble. The base and grille, remove easily for quick cleaning. Included with this cage are two feeding dishes made from decorated porcelain, decorative wooden perches, and a replacement tray clip? The measurements of this Bird cage measures 14 x 14 x 19 inches, with 1/2 inch provided for spacing of the hanging wire. This high quality, yet cheap decorative cages provide security and comfort for your bird. This charming Oriental Trading Company Bird Cage shows lovely and exquisite design following an old vintage style. This purchase offers you a set of great cages. There are loops at the top with a hinge and a swing hook on which to hang the cage. This cage is available in following size. This cage is useful as a conversation piece, not a birdhouse. It’s great for parties, weddings, graduations, baby showers, or to brighten up your garden. This beautiful product serves well as a holder for candles, a gorgeous centerpiece for the table, or a picture holder. This Jumbo bird cage comes in black and is amazingly designed to follow the vintage ﻿﻿﻿﻿﻿style ﻿﻿era. Two perches made of plastic and two plastic feeding dishes with hoods accompany this cage. This product offers easy cleaning with an easily removable grille and drawer. This cage measures 18 inches wide, 18 inches long, and 25 inches in height. There is a 5/8 inch allowance at the top for wire spacing. This bird home is spacious enough for birds to exercise and enjoy a play. So, it's a great decorative cage for small bird like Parakeet, Budgie, Canary, Parrot etc. This bird cage has eye-catching appeal and design with bird lovers who bought this product. There are two plastic feeding dishes, and two perches. This cage hosts two doors, one on the top of the cage and one on the front of the cage. There is 5/8 inch spacing between bars. This cage measures 25 inches in height and 18 inches wide. This beautiful bird home finds style in American Victorian. Your birds will find this cage a more than spacious home. This metal bird cage, made of iron show ﻿﻿high ﻿﻿durable quality steel providing weather resistant qualities. These lovely garden cages, sold in sets of two cages. These cages are available in two sizes. It’s a great decorative cage to accent any room of the home, a porch, patio, or garden area offering a great focal point to the room, warmth, and coziness. This product sells as a set of two bird cages. These ﻿﻿decorative cages, styled in a bronze finish, made of an iron material. These cages are lovely to look at and offer a fabulous accent for your inside or outside decorated with designs in embossed floral and pattern of diamonds. The cage is domed at the top where there are latches sporting hangers so you can hang these cages in any opening. These accessory cages measure 24 inches or 16 inches. This product offers an exquisite conversation piece, adding warmth and cozy appeal to the home, providing a unique way to decorate your home seasonally. This metal product comes in a set of two bird cages crafted to become a decorative accessory inside or outside your home, making these bird cages affordable while giving a boost to your home's decor. The style of these cages is of French Country. Designed in iron with a vintage ivory color offers a focal point in the home. These bird cages are ideal for multiple purposes related to home or office decor, parties, wedding receptions, showers, gardens and as unique, wonderful accents to the home. Whether you are looking for a quality bird cage for your birds or a decorative cage to hang and accessorize your home inside or outside on the patio or garden area these cages are perfect are the perfect answer to fit either need. We gathered all the necessary information and did the work, now all you have to do is make an informed decision on which product best fills your need.